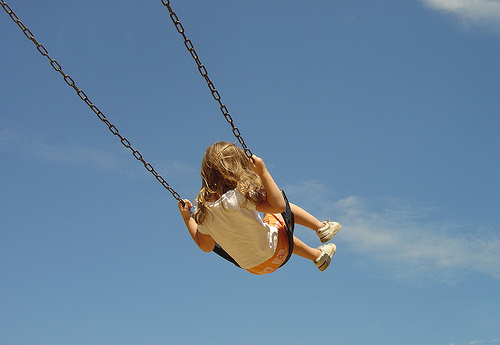 After a year or so of widowhood, a picture came to my mind: my innocence was gone---as if I was a little 4-year-old girl--- and that God, like a bully at the playground, had punched me off my swing. He and Bruce then ran away, leaving me crumpled and crying in the gravel. To look at me, though, everything seemed fine. The kids and I were coping. I exercised a lot. I traveled more than usual with the children, spending extra time with faraway family. I kept busy with work on my house, paying the bills, and developing friendships with some amazing people God sent my way. But inside me the vision of getting knocked down onto sharp stones grew stronger. I missed my husband. The missing and loneliness became like a constant physical ache. God was silent and His distance seemed further. Unanswered questions—What should I do? Where can I turn? Where do I even start?—nagged relentlessly. Looking for relief, I attended a grief workshop that met weekly at a nearby church. It was helpful in many ways. I knew feelings lurked in my heart that were hard to capture and identify on my own. The topics presented each week brought these emotions to the surface. I wrote about them in a journal and that was therapeutic. I met a roomful of other recent widows and discovered I wasn’t alone. I still smile as I remember precious times when we laughed at our late husbands, or ourselves, with a freedom we found nowhere else. But these dear ladies were just as hurt and confused as I was, if not more. Some of them were angry, others sweetly claimed God’s promises, the rest scrambled to fill the void in their life with a range of activities from Bible studies to boyfriends. As much as we could relate and love each other, they couldn't answer my questions. I enjoyed being with these ladies, but I began to realize that I wanted, I needed, an experienced role model to show me the way through this valley of grief. I needed to know if anyone else had experienced getting hit by God or wrestled with my questions. Even though God seemed distant, I decided to ask Him what I should do. I pictured myself walking over to God's house, and up the steps of his back porch to that locked door. At this point a couple of bits of information came to me. A woman in my grief group tried to help me with Isaiah 54:5, which says, “For your Maker is your husband.” I'm glad some widows find comfort in that, but honestly? Those words mocked me. And then I found out that nearly 700,000 women are widowed each year here in the United States. I did the math: over 1900 women a day! I shook my head at the numbers: one Bible verse for widows and almost 2000 widows every day right here in the US of A! This ticked me off. Knock, knock. "What kind of husband are you? Only one little verse for all of us?" I hollered as I rattled the doorknob. Thank you for letting us hear your own story, Ferree. Ferree,just read part 1 of your book - my question is where Isaiah says "Your Maker is your husband" where could I refer the WIDOWERS in my group for similar Bible passages, who have lost their wives? Eighteen are in my group and we meet every Wednesday and I always tell them about you if I read to them what you have written. Thanks for your reply - Cathy P.
Good question Cathy! I will do some research and get back to you, but please give a day or two. Thanks. Good for you to be ministering in what sounds like a really great group! Hi Ferree, When my husband died I felt God was so far from me and I was so far from him that I could not even say a prayer. I picked up my bible and read the Psalms out loud. I only had to read the first few to see that even David, a man after God's own heart, also felt far from God at times. He said things like "Answer me when I call to you; Give ear to my words, O Lord; Listen to my cry for help; and How long, O Lord, how long?" I'm looking forward to hearing the rest of your story tomorrow! That Bible does it all the time, D.! God knows us so well, and as you've seen, is able to meet us at our point of need with Hi living Word. I'm so glad to hear your experience. Dear Cathy P., I took more than a day or two to respond to your question, and I'm sorry for that, but I hope you'll be able to find my reply in the blog post for Monday, Feb. 10. Please let me know if it helps at all or if more questions arise that I can research with you. Ferree, your picture of being knocked off the swing and your husband and God running away is quite profound. It's like that isn't it? I've had thoughts like, "That's nice you're up there with God but look what I'm left to deal with"
I know, I felt kind of abandoned. It's an extremely empty and painful loneliness. I'm so grateful God delivered me from it, and so thankful when I see other widows come out of it too. Please let me know if you want to talk about it more.